Arizona Roof Rescue » Blog » Roofing Survival Guide: Is Your Arizona Roof Ready to Fail? Having to replace your roof can be a costly investment. It’s no wonder why the vast majority of homeowners want to put it off until the very last second in order to hold onto their money. It’s understandable. But there is a downside to this. Waiting for your roof to fail can mean some pretty serious structural and property damage. The best course of action is to bite the bullet and take care of your roof before the worst case scenario becomes a reality. There are many sign that you can watch out for that would signal that your roof is starting to fail. These mean that it’s time for your roof to be replaced as soon as possible. How old is your roof? This can be the single most important factor when it comes to judging whether your roof is nearing the end of its lifespan. For example, three-tab asphalt shingles on roof for more than 20 years means that it’s time to get a new roof. Architectural shingles can last as long as 30 years, metal roofs as long as 45 years and concrete tiles as long as 50 years. So depending on what your roof is made of plays a key role in determining its lifespan. There are other things to consider when considering the age of your roof. Where you live plays a big role in this equation. The weather in the area you live as well as how much maintenance has been performed on your roof play a key role in how long each material is going to last. Something as innocuous as the color of your roof can even have a say in the matter. Darker colored roofs actually absorb more heat and this can cause them to need to be replaced sooner. If your roof faces the south it will actually have a shorter life expectancy for the same reason. And the higher the pitch of your roof means it will last longer than roofs with lower pitches. Can you see damage to your roof? That’s a pretty strong indicator that it needs to be replaced. Maybe you have a lot of shingles that are lifting away, or are even cracked or missing. This is a tell tale sign that it is time for a new roof. If the edges of your shingles are curling, or if you see darkened, smoother areas this can be a sign that protective granules have eroded away, and this can be trouble. Again, this means a new roof is in order. Just because you may not have the ultra common asphalt shingles does not mean you’re out of the woods just yet. There are many other signs of damage to look for. For starters, concrete tiles that are cracked are in trouble. And if you have a metal roof you need to be mindful of any rust that may appear along the seams, ridges, fasteners and vents. These metal roofs can be known to lift up where the edges overlap. You need to keep a watchful eye out as these sorts of problems can lead to leaks, and nobody wants that. Maybe you’re not outside? Not to worry, you can easily detect damage from inside your home. If it is sunny outside take a little trip up to your attic, if you have one. Make sure to leave all of the lights turned off and carefully look at the space around the chimney and any vents. If there is damage to your roof it will manifest itself as tiny pinholes of light coming through. This mean that the flashing is damaged. That means, once again, that your roof is going to need to be replaced as soon as possible. Still Not Sure If Your Roof Needs Replacing? If you are still not sure if there is damage, or if you just don’t know which option is best then we would advise you to call a professional. 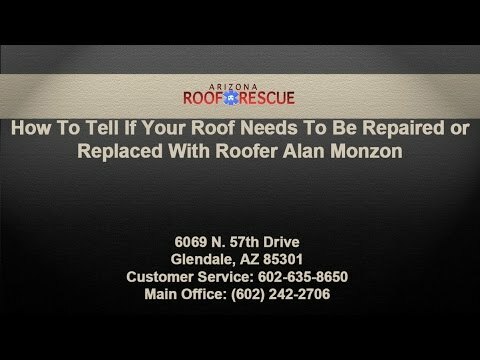 The professionals at Arizona Roof Rescue are sure to provide you with an honest opinion on what makes the most sense for you and your family. And if you’re worried about money you can rest assured that we will work with you to find the solution that fits your budget. Nobody wants to replace their roof. We strive to make this process as painless as possible. All of our expert roofing contractors in Litchfield are licensed and insured and ready to help. Home » Blog » Roofing Survival Guide: Is Your Arizona Roof Ready to Fail?